Muco coccinum is an exceptional homeopathic preparation containing various strains of the worse flu epidemics of the 20th century, specifically formulated to help boost immune function, and stimulate the body's own defenses to combat and prevent symptoms associated with flus and potent viruses. Serious complications such as bacterial infection or pneumonia can be deadly, especially in individuals with compromised immune systems. Scientists and virologists are greatly concerned that one or more of the new, emerging flu viruses will be lethal and highly contagious, causing epidemics. Muco Coccinum helps to elevate the body's immune response to any flu. The company makes no claim that it will prevent the Swine Flu, but that is could help the body better respond to an infection of the flu. At the first sign of symptoms, take one tablet allowing it to dissolve under the tongue. If symptoms persist, take one tablet two or three times during the day. If symptoms continue to persist after three days, discontinue use and seek advice from a health care practitioner. Is Muco coccinum effective and safe? Muco coccinum is a safe homeopathic preparation of bacterial and viral fractions, formulated to stimulate the body’s own defenses in order to combat influenza. Over 1/2 million doses sold annually. Easy to take - melts under tongue. Neutral taste, without dyes or preservatives. Mucococcinum is a remedy that is very effective for prevention of colds and alleviating symptoms especially if there is a lot of mucous and congestion. Mucococcinum is a homeopathic medicine that gently activates the body's natural defense mechanisms to protect itself from contracting the flu-bug. It is prepared homeopathically from various bacterial and viral fractions. This homeopathic medicine can be greatly effective at shortening the duration of an existing flu if taken at the first signs of symptoms. With proper use, Mucococcinum can offer a safe and natural way to alleviate symptoms. 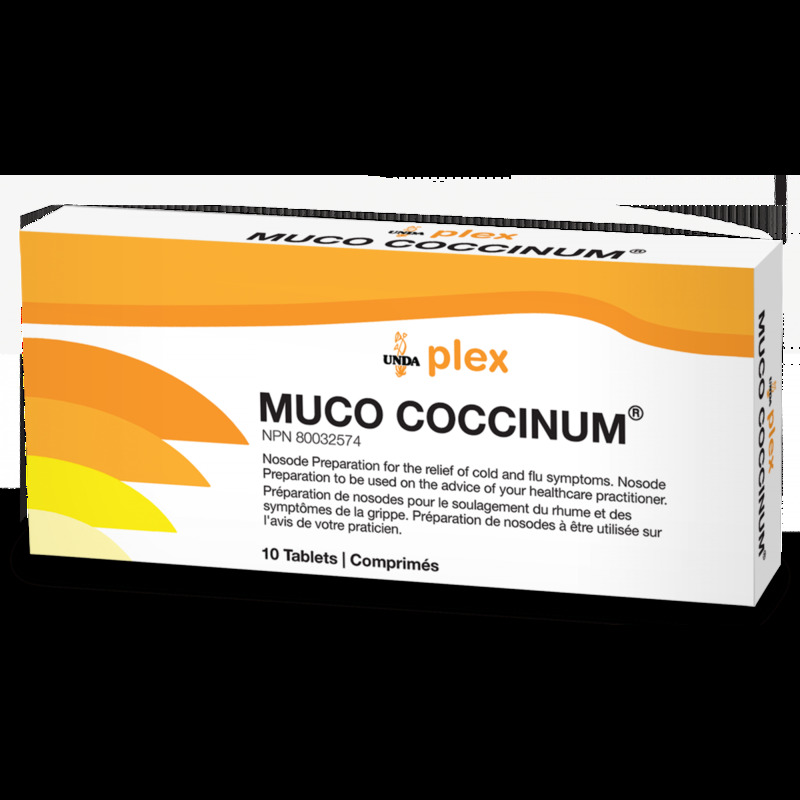 Muco coccinum is indicated for all types of flus, colds and respiratory ailments. Note: As with any homeopathic treatment, it is not advisable to consume products containing mint (ie. Candy, chewing gum, toothpaste, etc. ), or to use products that contain menthol, camphor, or eucalyptus (e.g.- Tiger balm, Ben-Gay, mentholatum, etc.). These products can antidote the medication, so do not use them around the time of taking mucococcinum. During the incubation period: at the first sign of symptoms (shivers, aches and pains, sore throat) take 1 tablet and let dissolve in mouth. If necessary, repeat 2 to 3 times during the day. Muco Coccinum® 200 should be taken at the onset of the cold or flu, in order to prevent a full outbreak of the condition. If the condition develops: 1 tablet each morning and evening for 3 days. Preventatively: Muco Coccinum® 200 may be prescribed right from the beginning of the autumn season, with one tablet to be taken every 15 days. 1 tablet per week throughout the winter season. Muco Coccinum is not indicated for pregnant women due to research on it's safety for pregnant woman by the company that makes this product. Homeopathic remedies do not have the actual molecular ingredients that are used to make these products, as they have been diluted down to such a level that the original substance is no longer there, it is the energetic quality of the substance that remains. Though those energetic qualities do move the body to build up it's immune response antibodies, so those antibodies can recognize and react to these flu strains in this product if you are exposed. Read customer questions and answers about Immune Support on our blog. Every year in the United States, on average 5% to 20% of the population gets the flu, more than 200,000 people are hospitalized from flu complications, and about 36,000 people die from flu-related causes.3 In Canada, influenza results in an average of 20,000 hospitalizations and 4,000 deaths each year.4 Some people, such as older people, young children, and people with certain health conditions, are at high risk for serious flu complications. An influenza pandemic can occur when a new influenza virus subtype emerges and spreads easily among human beings. A new pandemic is considered inevitable but nobody can predict when and where it will emerge, who it will affect or how severe it will be. The consequences of the next pandemic may be large numbers of cases and deaths globally, as well as disruption of societies and economies (due to staff absenteeism and disruption of trade within and between countries). Flu viruses mutate constantly, producing new strains from year to year. The current flu vaccines are ineffective against any new types of flu as they do not provide protection against the latest flu strains. By the time the flu strain is obtained and manufactured, the particular virus may have mutated and new flu strains may have emerged, making the previous years vaccines ineffective. A strong immune system is paramount in fighting off any viruses minimizing the proliferation of bacterial and viral microorganisms. Homeopathy is a natural approach to medicine that works without contraindications or side effects to stimulate the body's curative responses so the body heals itself. Your body has the ability to heal itself. When you are ill, your body produces symptoms, which is how we know that the body has recognized that something is wrong and is actively working to heal itself. This "natural regulator" is your body's auto-regulatory mechanism and works to keep your body in balance - or in a state of homeostasis. Here's an example of how this works: Think of your "natural regulator" as your internal temperature gauge. If you go outside and it is very hot, your body will recognize it is too hot and begin to perspire. Your homeostatic mechanism is producing a symptom - perspiration - in an effort to cool down the body. If you go outside and it is very cold, the symptom is shivering. Your homeostasis mechanism is trying to warm the body up by shivering to produce heat. Think about the last time you were shivering. You could not control it and you did not stop until you were warm. It is the same way with homeopathic medicines. If you are ill and your body is showing symptoms, the symptoms will not disappear until the source of the symptoms has disappeared. Homeopathic medicines stimulate your body's homeostatic mechanism so your body heals itself by dealing with the sources of your symptoms. Homeopathy is different from most conventional medicine because conventional medicine simply defines health as the lack of symptoms (if you dry up a runny nose, is your cold gone and are you healthy). Homeopathy defines health as the lack of disease (if you get rid of the source of the runny nose in the process of dealing with the source, the runny nose will disappear on its own). by John A. Borneman Jr. RPh. Homeopathy is a medical method that has been used in the United States for over 200 years. Due to the current patient anxiety about interactions, contra-indications and side effects of prescription and over the counter drugs the homeopathic method, which is free of these causes for concern is enjoying a new wave of popularity. Homeopathy is natural or mild medicine. The remedies are usually natural substances which have been diluted and potentized many times so that when they are used according to the homeopathic method, they stimulate your body's own defenses to move you toward a healthier state without causing you any side effects. Homeopathic remedies are most effective in treating acute conditions characterized by a sudden onset of symptoms. Of the hundreds of homeopathic remedies used by health professionals, a few have become popular favorites for treating those symptoms we usually associate with cold, flu and allergy. In many instances the main symptom has a modifier or a condition, which we will call the "clincher". The clincher helps us to choose or confirm the correct homeopathic remedy. Although many patients and practitioners seem to take particular delight in the challenge to choose that single remedy that will work quickly and completely in relieving symptoms and move the patient toward good health, this is not the approach we must take to decide which is the appropriate homeopathic remedy for any condition. During your visit to the pharmacy you rarely have the time to process all of the information to make such a challenging and precise selection. The good news is that certain homeopathic pharmaceutical companies, having years of experience servicing the homeopathic clientele, have developed combination formula which have a proven, highly predictable probability of success in relieving common sets of symptoms which we refer to as colds, flu and allergy. Symptoms of cold, flu and allergy respond well to homeopathic treatment. There is no single homeopathic remedy for 'Colds', but homeopathy offers a choice of safe and effective remedies for treatment of many of the common symptoms of colds. Since colds often present many symptoms, it is much easier to use the popular combination remedies offered by homeopathic pharmacies. Homeopathic remedies are selected and used based on the set of symptoms, not on the cause of the so-called disease. Whether your symptoms are the result of bacteria or virus is of no concern to the homeopathic patient. You select the remedy based on the symptoms, not on the cause. Influenza or Flu causes fever, chill, shivering, general ache & pain. In uncomplicated cases the acute condition usually lasts several days. Symptoms are usually relieved by homeopathic remedies. If, however, the symptoms worsen or do not respond in a reasonable time, discontinue use and consult your health care professional. Your homeopathic remedy can be taken along with a prescription to accelerate recovery. Coughing is your bodys way of keeping foreign matter out of the airways. Presence of bacteria, dust or pollen can stimulate production of mucous. When this is excessive, it causes coughing. Your first impulse is to stop the cough. This is not always the best thing to do. Some coughing can be helpful in clearing the airway. Excessive or dry hacking cough can damage and weaken the delicate tissues and make them susceptible to infection. Wisely selected and administered homeopathic remedies can be helpful, in control of cough symptoms. A few words about handling and taking your homeopathic medicines may be helpful. Homeopathic remedies should be administered under very careful conditions. Before taking your homeopathic medicine, your mouth should be clean and rinsed with water. You should avoid mouthwashes, gum or candy containing mints or aromatics just prior to taking your remedy. Allow the remedy to dissolve slowly in your mouth. The homeopathic remedies, available from different manufacturers, may vary in appearance. Some dosage forms are medicated sugar pellets, tablets, drops or those specially prepared soft tablets. The special soft tablets are a particularly popular and effective way of presenting homeopathic remedies. Over the counter Homeopathic remedies are mild, safe and effective when used to relieve simple, self-limiting conditions. There is a high probability that they will relieve the annoying symptoms associated with Colds, Flu & Allergy. They will not interfere with your conventional medicines, nor present any side effects. Do not discontinue any prescription medications you are currently taking without the advice of your physician. If your symptoms persist or do not respond to the homeopathic remedy in a reasonable time, discontinue use and consult your health professional.